A 100% acrylic emulsion designed to prime pavement surfaces and promote the adhesion of SportMaster Acrylic Color Coating products. Approximately 200-300 square feet per gallon depending on surface porosity. 100% acrylic emulsion designed to prime pavement surfaces and promote adhesion to concrete surfaces. Acrylic Adhesion Promoter is a clear drying, one part water based acrylic emulsion. It is designed to prime concrete pavement surfaces and oxidized asphalt surfaces and promote the adhesion of SportMaster Acrylic Color Coating Products. There is no special timing for applying successive coats of material. Once Acrylic Adhesion Promoter is dry, the next coat of product can be applied. Pavement surface must be cleaned entirely of dust, dirt,debris and all loose materials. Repair of pavement surface defects, depressions and cracks should be complete prior to application. New concrete surfaces must cure 28 days prior to application. Concrete surfaces should have a fine broom finish or similar roughened texture. Etch surface with phosphoric or muriatic acid and rinse thoroughly with water. Allow concrete to dry completely before applying Acrylic Adhesion Promoter. Stir thoroughly before using. Apply Acrylic Adhesion Promoter as is. DO NOT DILUTE. Use roller, spray, or broom to apply. Apply a thin coat of Acrylic Adhesion Promoter at the rate of 200 – 300 square feet per gallon. Do not leave excess build-up of material on surface. 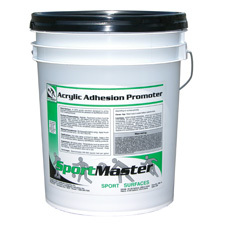 Allow Acrylic Adhesion Promoter to dry completely before applying SportMaster Coating Products. Stir before using. Temperature must be above 50ºF both during application and for a period of at least 24 hours after application. Do not apply when rain is imminent or forecast. Keep from freezing. Close container when not in use. Forty-Five to Ninety (45 -90) minutes under optimum conditions. View in Catalog 5 gal. Pail 46 lbs. 30 gal. Keg 270 lbs. 55 gal. Drum 510 lbs.